Developer’s description of app: The classic game. 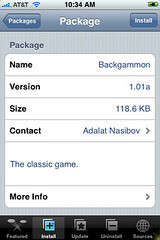 Backgammon is available in the Installer.app through the Ste Packaging source. 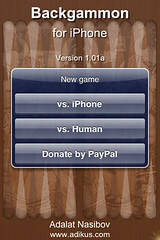 When you open the app you will find an intro screen which allows you to play vs. iPhone or vs. Human. You can also donate via PayPal. Once you have made your selection it will open to the game. To roll the dice just tap on Roll. To move the little pieces just tap the piece you would like to move then tap on the place you would like to move it to. You can undo a move by tapping Undo in the bottom right corner. A running score is kept in the bottom left corner. Honestly…I have absolutely no idea how to play Backgammon so…that is about all of the instruction I can give you!! 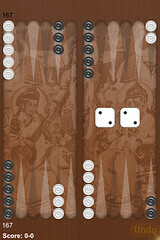 However…here is the link to the Wiki article on Backgammon….hopefully that helps!! For updates to this app, see below in the Apple iPhone School’s Backgammon Articles section.